The problem with most stand-up comedy on TV is that it’s usually censored. What’s even worse is that if you don’t like a comic, tough. You have to wait until their entire set is finished. ROFL, which was formerly known as Rooftop Comedy, was picked up by Rivision3 recently and given a bigger budget. As a result, the show now features more widely known acts like Chris Porter and Roy Wood Jr. who’ve frequented Comedy Central numerous times. In fact, a typical 10 minute episode runs a bit like an uncensored version of Premium Blend. The only things missing are a live band and a host, but who really needs those anyways? 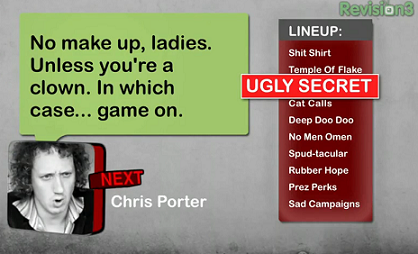 A typical ROFL webisode covers numerous topics like the ones above. Catch new episodes weekly on Revision3.